Today’s smart home appliance technology goes well beyond incorporating a tablet screen on the refrigerator door. Builders are giving homebuyers increased connectivity in their homes. Lennar, for example, now has a Wi-Fi certified home design that includes a smart product package and voice control by Alexa-enabled products. 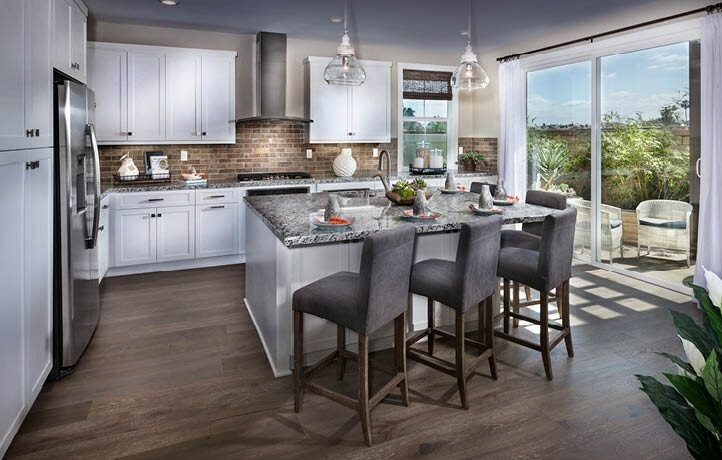 Residence 3 plan by Lennar in Covina, California. Connectivity has been the major thrust of kitchen appliance innovation in recent years. Emphasis has been on developing “smart” products with Wi-Fi connectivity. The goal has been to develop appliances that can communicate with one another and with you. Appliance manufacturers have been working diligently to integrate their products into the Internet of Things — the idea of connecting appliances and other items to the Internet via cloud technology. Such technology provides consumers with remote control capabilities and facilitates receiving text messages and alerts from their appliances via a smartphone, tablet or computer. This has required manufactures to develop or acquire the needed technology. Whirlpool, for example, has partnered with Nest (developer of the Learning Thermostat). 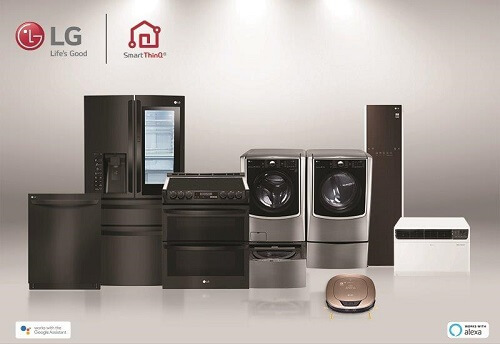 LG introduced its ThinQ technology to control its smart appliances, home entertainment and mobile devices, and Samsung acquired SmartThings (producer of a hub that talks to appliances via sensors). There’s no doubt that today’s home appliances offer real connectivity, allow you to monitor their function, provide self-diagnosis alerts for maintenance requirements, automatically work to reduce energy usage and are beginning to learn and react to the behavior of individual users. Now, the push is on to design into these appliances the ability to be operated by voice-controlled assistants, such as Amazon Alexa, Amazon Echo Show. Google Home, HomeKit/Siri by Apple, and Microsoft Cortana. LG SmartThinQ appliances respond to voice commands via Alexa and the Google Assistant thanks to the company’s open platform, open partnership approach to smart products. Samsung has developed its own voice-controlled device called Bixby and recently announced a new generation of Family Hub refrigerators that incorporate the technology. At CES 2018, manufacturers unveiled a host of appliances that work with one or more of these voice-controlled, digital assistant devices. With machine-learning technology, these connected and voice-controlled appliances can do everything from showcasing the foods in your fridge to providing help in reordering foods, offering recipes and assisting in cooking. LG’s new InstaView ThinQ refrigerator is the first smart refrigerator with Amazon Alexa built in. It features a 29-inch LCD touchscreen that displays notes, calls up recipes, alerts you to food expiration dates, and streams audio and video content. The LG system can also preheat the oven and preset the dishwasher based on what’s on the menu. You can even get a weather report on the refrigerator display. Plus, you knock twice on the panel and it becomes transparent so you can see what’s inside the fridge. Smart Assistant features also allow you to remotely control Whirlpool’s new smart side-by-side refrigerator and its smart dishwasher with 6th Sense Live technology. GE’s kitchen hub control center, which consists of a 27-inch display above the stove, works with both Google and Alexa devices and plays audio and video programs. A wide-angle camera inside lets you remotely check the contents. The fridge will then suggest what you can cook based on the leftovers. Café series refrigerators from GE now offer a Keurig K-Cup brewing system that can dispense coffee, tea, hot cocoa, cider or hot, filtered water and can be scheduled through the GE kitchen app. Smart washers and dryers from Whirlpool text you when the wash or dry cycle is finished. The product’s 6th Sense Live Technology allows you to remotely control start/pause features and turn on the washer’s FanFresh or the dryer’s WrinkleShield cycle to keep dried clothes fresh. Technology includes Smart Nudges (reminders), Smart Alerts and Smart Store (notes when it’s time to replace detergent). Whirlpool’s latest is a Smart All-In-One unit that is both a front-loading washer and a ventless electric dryer. You can start the machine remotely and receive alerts using apps or use Amazon's Alexa to start or pause it, run an option, or find out how much longer the wash or dry cycle will take. “Guided cooking” is another major trend in today’s home appliances. In the past, this was limited to apps and touchscreens for small appliances. Not anymore. Smart major appliances now also offer recipe apps and cooking assistance. The new GE Profile wall ovens have a 7-inch LCD touchscreen that can provide cooking help. Touchscreens on several GE wall ovens allow you to choose the precision cooking option based on the kind of food you’re cooking. It will even tell you what type of pan to use. The GE kitchen app allows you to use your smart phone to preheat the new GE Café series oven; receive alerts, operate the icemaker and adjust the temperature on its Wi-Fi-enabled refrigerator; and control the series’ stainless steel dishwasher. Another app lets you monitor cycles and change settings on smart GE washer and dryer products. GE Appliances is now a Haier company. BSH Home Connect appliances from Thermador and Bosch use the “Kitchen Stories” food platform with videos and cooking instructions and can send heating instructions to smart ovens. LG announced connected appliances featuring a seamless integration with both the Innit and SideChef apps. While the apps read directions to you, the oven automatically knows to preheat your oven and set timers for your recipe. Innit is also available on BSH and GE products. Whirlpool fridges have enhanced image-recognition so that they can inventory food on hand and order replacement items via Instacart. Fridges with touchscreens will have Amazon Virtual Dash Buttons for reordering groceries. The firm’s new smart front control range and microwave are integrated with its Yummly app. This second-generation app, which supports Google Assistant and Amazon Alexa, finds recipes based on your “likes,” and preheats, cooks and turns off the oven to match. It allows you to remotely change the unit’s temperature settings. The scan-to-cook feature lets you scan the food’s barcode and then sends directions to your smart oven on how to cook this food. Induction cooking is easier to control remotely than gas or electric. Accordingly, the premium built-in Chef Collection of induction cooktops from Samsung that feature Virtual Flame technology are notable since they make use of LED surface lights that shine onto pans to give the visual of gas cooking, with the precision of induction. One major advantage in being “connected” is that it allows appliances to access the national Smart Grid, detect when power consumption in your area is low and adjust appliance operation to capitalize on lower energy rates in off-peak hours. But smart appliances, according to John Taylor, senior vice president of public affairs and communications for LG Electronics USA, are only worth the extra cost if they are easy to use and if they provide useful information, offer worthwhile assistance or convenience, or alert us to potential maintenance or safety issues, in addition to helping reduce operating and energy costs. Currently, smart appliances are hindered by the difficulty of developing a common standard for interconnectivity, a common language so that competing appliances can communicate and work together. The industry is struggling to develop an open, wireless network system that can access, communicate and interact online with appliances from competing manufacturers via a smartphone app or to consolidate on a system that allows them to sync with a hub or cloud service that is Internet connected.